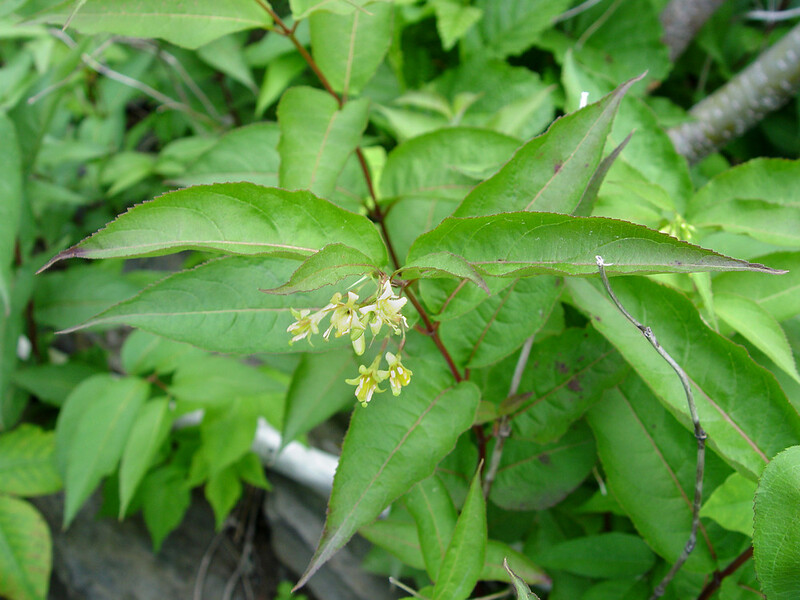 Diervilla lonicera.Donald Cameron.New England Wild Flower Society.gobotany.newenglandwild.org (Accessed 7/2014). 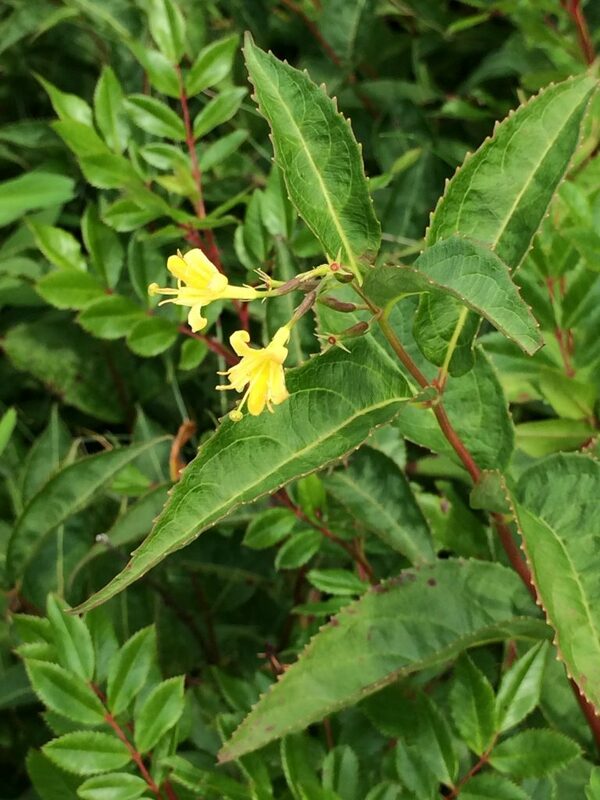 Diervilla lonicera is a shrub to 12 m tall, twigs ridged, base scaly. Leaves opposite, oblong, to 15 cm long, tip long-pointed, margin finely toothed, fringed with hairs, stalks to 1 cm. Flowers yellow, becoming reddish, tubular, bilaterally symmetrical, funnel-shaped, to 2 cm long, hairy inside, stamens as long as petal lobes, stigma longer, in clusters of 3-7, blooming June-July. Diervilla lonicera old fruit. L. Wallis. Herbarium, U. Michigan. 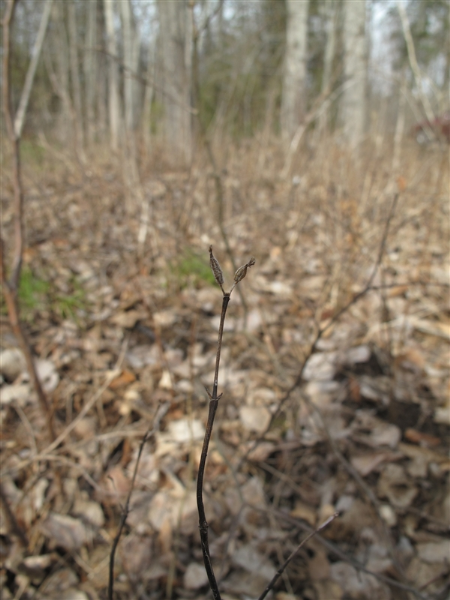 michiganflora.net (Accessed 3/2018). Fruit to 1.5 cm, slender, a dry capsule with beak. Frequency in NYC: Very infrequent. mostly north of NYC. Habitat: Dry, rocky areas, soil, pH 4.8-7 (USDA, NRCS 2011). Very tolerant of shade. Tolerant of drought, soil compaction. Intolerant of flooding (Hightshoe 1988).